St. Patrick’s Day is just around the corner and I started experimenting with a Corned Beef and Cabbage recipe cooked in the Instant Pot. I knew it could be done, but wasn’t sure how it would all work out. 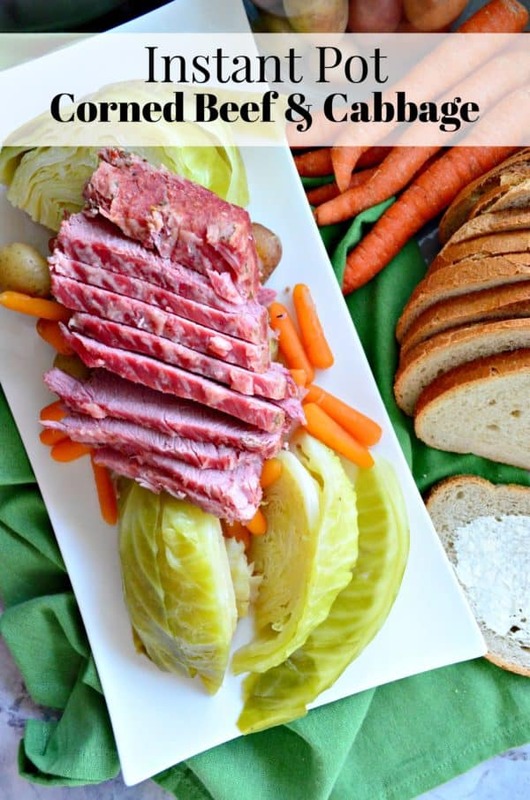 The Corned Beef has to cook for 70 minutes, and I knew if I was to put all the vegetables in with the meat they would be shriveled to nothing by the time the meat was done cooking. I did something I don’t always do… I cooked the meat first, and then removed the meat and then cooked the carrots, potatoes and cabbage together. The veggies took minutes compared to the meat. Best of all–one pot and cooked within 2.5 hours. Not 8-10 hours in a slow cooker or a few hours on the stove top. If you cook the corned beef on a stove top you know you have to be home the entire time. At least with this method you can put the meat into the Instant Pot, and then leave to run a few errands. Coming back to your home knowing that your house will be fine and in tact and dinner is just about cooked. 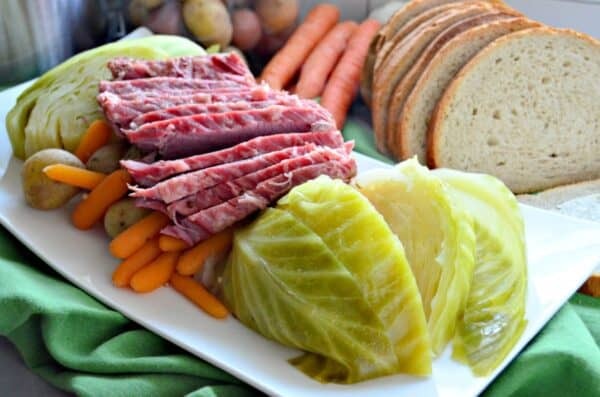 For as long as I can remember, I’ve always cooked my Corned Beef & Cabbage in the slow cooker. One of the first things I was surprised by when the beef was done cooking in the Instant pot was how much the meat shrunk. Be prepared–with this method the meat reduces down by almost half. I was shocked. Here I was planning all these ways to use up the leftovers, and instead I had just enough to have dinner with my family. However, once I sliced into the corned beef and we began eating I realized this was the most tender corned beef I had ever had! So my consensus–I’m okay with cooking my corned beef in the Instant Pot and it shrinking to half the size of the original cut I bought because of the tenderness it yielded was perfection. It’s what I strive to do each and every year when I make this meal. Which by the way–I try to not reserve this meal for just on St. Patrick’s Day. I try to make it at least 2-3 times a year. You might also wonder why I’m using mini potatoes and baby carrots in this recipe. Not using larger potatoes and chopping them and using whole carrots. It’s all a preference and to me a big time saver. I just had to rinse and place them in the Instant Pot. I didn’t need to peel and chop. It cut down about 10 minutes of time, and with two little ones to run after I’m all about quick prep! Everyone in my family enjoyed corned beef and cabbage. Of course I’m going to let you in on a little secret. To get my almost 4 year old to eat Corned Beef and cabbage we told him it will make him fart. True story. One thing I’ve learned as a boy mom –if you base everything around bodily functions they tend to eat more of it. You better believe he ate every single piece of corned beef and cabbage on his plate. So if you own an Instant Pot and ever wondered if you could cook your favorite Irish dinner in it–then give it a try this St. Patrick’s Day! Place the corned beef in the Instant Pot fat side up. Add the onion, garlic, and water. Close lid and pressure cook on "Meat" setting for 70 minutes. Allow a Natural Release for 15 minutes. Then, release the remaining pressure by turning the venting knob from sealing position to venting position. Open lid carefully (always away from your face). 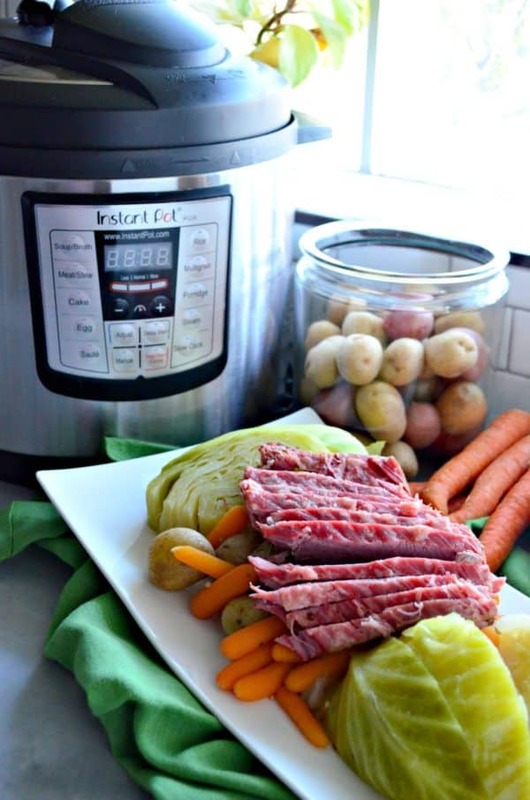 Remove the corned beef from the Instant Pot and drain half of the liquid from the pot. Place the mini potatoes, baby carrots and cabbage in the Instant Pot. Close lid and pressure cook on Manual at High Pressure for 2 – 3 minutes, followed by a Quick Release. Open the lid carefully away from your face. Slice the Corned Beef in half-inch thick pieces cutting against the grain. Divide evenly among plates and enjoy. Disclaimer: There are affiliate links in this post. That means if you click on a link and purchase from it I will make a small percentage of the sale at no additional cost to you.